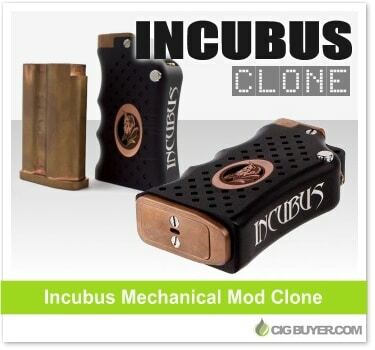 Here’s a stunner… the Incubus Mechanical Box Mod from El Diablo! This dual 18650 device includes a copper battery “clip” to hold your batteries, along with an ergonomic black delrin sleeve containing the Incubus logo and graphics. It has a top-mounted firing button, adjustable battery contacts and recessed 510 connection. Not only does this bad boy look stylish and unique, but it’s sure to billow clouds and be the envy of fellow vapers.